Perfect home & investment for the full or part timer-or rent it out when you're not home-Vacation Rental anyone?What a smart way to startThere's unobstructed mountain views & an ultra private backyard featuring a beautiful pebble tech saltwater pool/spa w/tanning shelf.Scarlet sunsets 360 days of the year.Close to downtown, nightlife, Casino, Convention Center & restaurants galore. Ruth Hardy Park & Desert Regional Medical Center are nearby. A short Uber drive takes you to the natural beauty of The Indian Canyons or to/from the P.S. Airport. 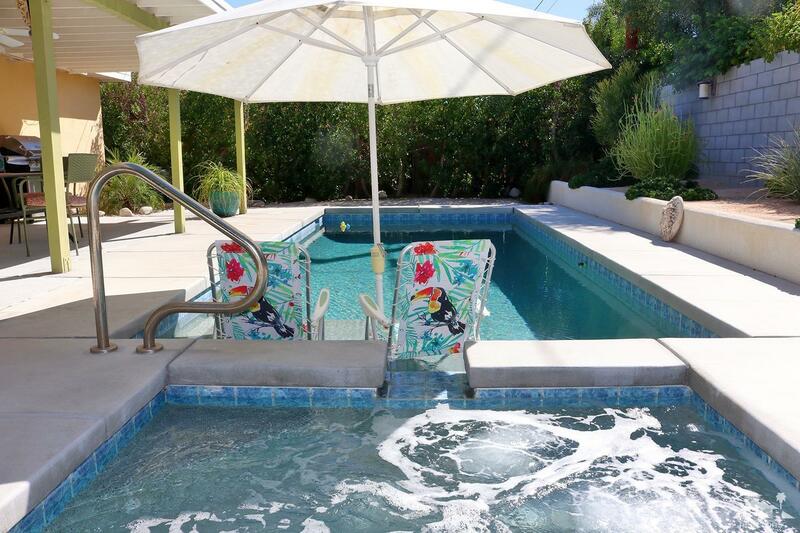 Chill out & relax or get your groove on-a mixture of charming Palm Springs & newer updates. Approx 1326 sq. ft.,3 comfortable bedrooms & 2 baths, romantic fireplace & even a garage to park your convertible! Talk about a MONEY MAKER!You own the land, no HOA + rental potential from $290per night -$750per night.Home nearby makes over $75K a year.Lowest price in Movie Colony East-priced to sell..& WOW- WHAT MOUNTAIN VIEWS!